Wow! My first blogging award. A big thank you to Brenda Davis Harsham at http://friendlyfairytales.com for nominating me for this award. Thanks again for the nomination. 🙂 I really appreciate it. 1. Cookies or Cake? Both? : Cake. I love cakes, especially chocolate and butterscotch. 2.Chocolate or Vanilla? : I love both. 3.Favorite Sweet Treat? : Cakes. I’ve got five/six favorites. 5.Sweet Nick Name? : Don’t have any and I cant remember calling anyone any. 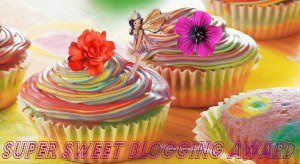 E. Notify your Super Sweet nominees on their blog. Will be doing that as soon as I hit the publish button. This entry was posted in The Everyday Stuff and tagged Award, Bloggers Award, blogs, Life, Nomination, Random. Congrats, I must say you do have an especially sweet blog! Oh my, those cupcakes look scrumptious! Reading and eating treats are a big faves. Unfortunately, I ‘m dieting and can only gaze wistfully upon the nummies. Congrats on award and thanks for the stopby.